This is Equation's long 'lost' debut recording. It was shelved by the record company (Warner), citing a lack of possible chart singles as reason for the decision. Thankfully, the album was released on Rough Trade Records in 2003. 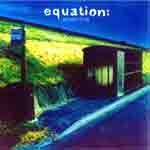 I would have a high regard for efforts of Equation's management.